People always ask me for my favorite tricks to keep the weight off during the "Eating Holidays" beginning with Halloween. 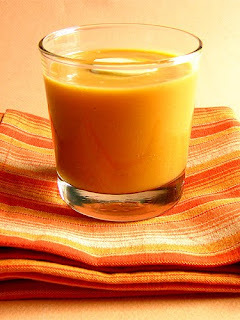 Try this Late Harvest High Protein Pumpkin Smoothie as a yummy, alternative to pumpkin pie and all the other fall/winter sugary, high Calorie desserts that will expand your waistline between now and the New Year. I like having this yummy protein smoothie before I go out, as it keeps me full so I'm not so tempted to overindulge. Orange colored squash varieties are chock full of powerful phytochemicals (or plant chemicals), such as antioxidants, vitamin C, and betacarotine, which is helps improve your vision. *For more delicious, healthful, and quick recipes that will get you through the holidays without packing on the pounds, buy Linda’s new SOUPer Slim Diet ebook at www.LindaLaRue.com/store.